John H. Breck Inc. and is dated 1960. The label is in rough shape as you can see. DAILY BEAUTIFYING SHAMPOO. AND A GORGEOUS FRAGRANCE THAT LASTS AND LASTS. NOW YOU CAN HAVE THE SUPER-BEAUTIFUL HAIR YOU'VE ALWAYS WANTED. 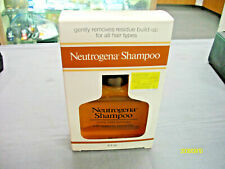 New Vintage Neutrogena Shampoo extra mild formula free shipping!!! Good used condition. If you don't see it then it is not included. They are often very old and may show aging or flaws. I do try my best to provide as many pictures as possible to help show details I may have missed. Most likely made in the 1970s. No barcode. 30% full. Please see photos. Contact me with questions. From a smoke-free home. With Finesse, your hair is always beautifully soft, shiny and manageable. Deep Cleaning Shampoo for styling aid build-up. - Special Value 20% More! Vintage Dimension Shampoo Deadstock Discountinued 1.5 Oz Sample Travel Size Full. Condition is New. Shipped with USPS First Class Package. Appears to have never been used, may have evaporated a tiny bit. Trending at $45.66eBay determines this price through a machine learned model of the product's sale prices within the last 90 days. As found used with light soiling and surface wear. 3/4 full plastic bottle. (2) Vintage - Apple Pectin Shampoo Concentrate, 16.9 oz. The bottle is in very good to excellent condition. There has been a small amount uses in the 15 oz bottle. Sorry about the reflection from the light. Condition is Used, the shampoo is not super thick but still soapy and bubbly in appearance when shook. vintage Revlon Aquamarine conditioner & extra body shampoo HTF NEW NOS 15 oz. Aquamarine with natural sea protein and minerals. The bottles are full. I EXPLAIN AS MUCH AS I CAN AND TAKE MANY PICTURES AT DIFFERENT ANGLES TO SHOW GREATER DETAILS. It is approx. This was an estate find. Bottle is in great condition with vivid print. It is a very clean bottle. Pantene Pro-V Shampoo Plus Pro-Vitamin Conditioner in One. Use at your own risk. We do our best to get the most accurate pictures possible. CONDITION: Both bottles are about 98% full which we believe to be a factory issue or natural evaporation due to age. 2 BOTTLES of HALF FULL! Vintage Alberto VO5 Shampoo Split End Treatment Shampoo cleansing 15 oz. Condition is New. Shipped with USPS Priority Mail Padded Flat Rate Envelope. Used Vintage Faberge Organics shampoo and conditioner Not very many of these left. Still smell great! Shampoo is not as thick as I remember, when I was a kid- maybe due to the age. Any questions, please ask From smoke-free environment NOTE: FOR SOME REASON THE WORD PEPPERMINT HAS BEEN POSTED ON THIS LISTING AND I AM NOT SURE WHERE THAT CAME FROM. IT IS NOT PEPPERMINT AND EBAY WONT LET ME REVISE THAT PORTION OF THE POSTING. THIS IS THE GENUINE VINTAGE FABERGE ORGANICS SHAMPOO. Add a map to your own listings. FREE Trial! The main ingredients in this shampoo are: chamomile, aloe vera, and passion flower. Vintage Head And Shoulders Dandruff Shampoo For Fine or Oily Hair Patented Clinically-Proven Formula Travel size 7 oz . Condition is New. Shipped with USPS First Class Package. Vintage - Apple Pectin Moisturizing Shampoo Concentrate, 33.8 oz. This one is from the reissue in the 1990's. "It's essence of 17 herbs and wildflowers makes shampooing a most delightful experience- like washing your hair in a fragrant mountain pool.". Copy, resale and redistribution of the original artowk and images displayed on this webpage is prohibited by law. Mid 1980's. There are some stains on the label. The bottle is almost full. Please see photos. Contact me with questions. From a smoke-free home.